Record-high tariffs have now cost Texas more than a billion dollars, according to new data released today at a trade town hall meeting in Houston. The data was released by Tariffs Hurt the Heartland—a nationwide grassroots campaign against tariffs— and compiled by the Trade Partnership, and includes the first look at the full weight of tariffs that have been imposed on $200 billion in Chinese imports and the resulting retaliatory actions against American exports. Texas businesses have now paid an extra $1.1 billion in additional tariffs, including $364 million in October, the most recent month for which data is available. 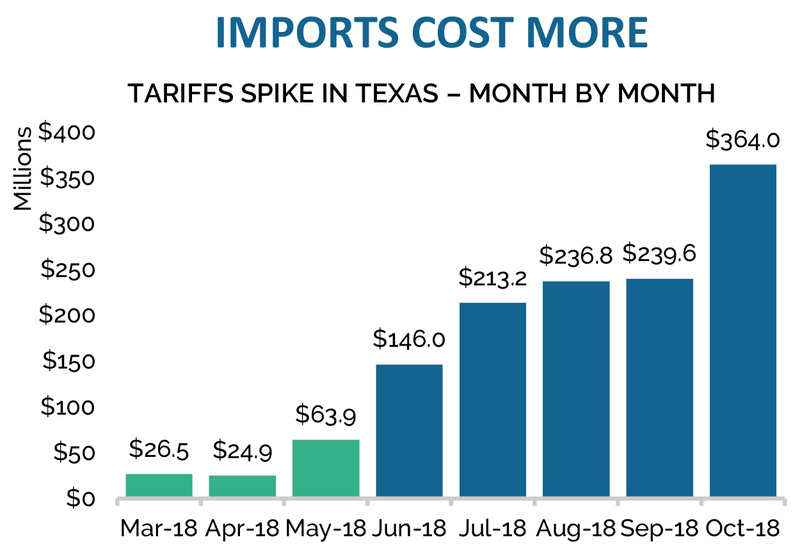 During that month, Texas businesses paid more than 12 times the tariffs they paid on the same products at the same time last year. The record-setting Texas numbers correspond with new national data showing American businesses paid $6.2 billion in tariffs in October, the highest amount for any month in U.S. history. See the Texas State Impact Report for more information. “The goal of the industry and policymakers should always be to keep high quality domestic manufacturing here in the United States, and PESA is very concerned that despite the best intentions, section 232 and 301 tariffs may have the opposite effect in relation to many areas of the energy industry,” said Petroleum Equipment & Services Association Vice President of Government Affairs Tim Tarpley. “Texas businesses are witnessing significant drops in exports as a result of the tariffs. These American businesses, farmers and financial markets are all reeling from these tariffs. Ending the trade war is essential to keeping America competitive in the global marketplace while growing our economy and the millions of jobs supported by trade here at home,” said Former Louisiana Congressman and Tariffs Hurt the Heartland spokesperson Charles Boustany (R –La.-3).